Dr. Ruth Janetta Temple was born in Natchez, Mississippi in 1892. After her father’s death, the Temple family moved to Los Angeles, California in 1904 where her mother worked as a practical nurse and Ruth cared for her five siblings. Temple’s interest in medicine surfaced when her brother was seriously injured in a gunpowder explosion. She recalled that “at that time I thought that women were nurses. I didn’t know they were doctors. When I learned that women were doctors, I said `Ah, that’s what I want to be’.” In 1913 Ruth Temple was invited to speak to the Los Angeles Forum, an African American cultural and political organization established in 1903. She so impressed Forum members, especially prominent black activist, T.W. Troy, that they “became deeply interested in my potential,” and “did the unprecedented thing” of sponsoring her with a five-year scholarship to the College of Medical Evangelists (which is now Loma Linda University). In 1918 Ruth Temple became the first black female to graduate from Loma Linda University. In that same year she opened the first health clinic in the medically underserved community of southeast Los Angeles. 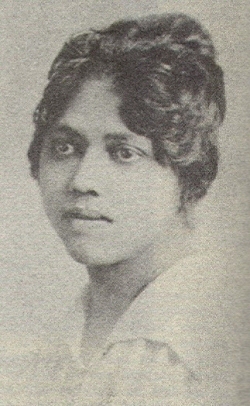 Unable to secure financial support to sustain the clinic, Temple and her husband, real estate developer Otis Banks, bought a house in east Los Angeles which they converted into the Temple Health Institute which provided free medical services and created the Health Study Club program which provided health education to parents, teachers, and school children. The health clinic’s model was duplicated in communities across the nation. Ruth Temple’s internship in maternity service at the Los Angeles Health Department (1923-28) inspired her to specialize in obstetrics and gynecology. In 1941 the Los Angeles Health Department offered her a scholarship to pursue her Master’s degree in public health at Yale University. Despite the prevailing racial prejudices, Temple was on the teaching staff of White Memorial Hospital in Los Angeles where she taught white medical students. She held many prominent positions with the Los Angeles Public Health Department from 1942 to 1962 and received numerous awards and honors. In 1983 the East Los Angeles Health Center was renamed the Dr. Ruth Temple Health Center. In 1984, Dr. Ruth Temple died in Los Angeles at the age of ninety-one. Darlene Clark Hine, Elsa Barkley Brown, Rosalyn Terborg-Penn, Black Women in America: An Historical Encyclopedia, vol. 2, (Bloomington: Indiana University Press, 1994), 1156-1157.